Last week, on March 1st, many Mormon Trail families gathered together to recognize four long, dedicated months of basketball. Jr. high and high school boys and girls participants were recognized, and received their team and conference awards for 2015/2016 season. For Jr high boys, Zach Hofmann was titled Mr. Rebound, and George Shanks Mr. Defense. Luke Parmer received an award for offensive player of the year. High school girls voted Alexis Roberts for most improved, Jordan Gehlhaar for defensive MVP, Katelyn Dent for offensive MVP, Payton Gwinn for the hustler award, and Kaylee Parmer for MVP. 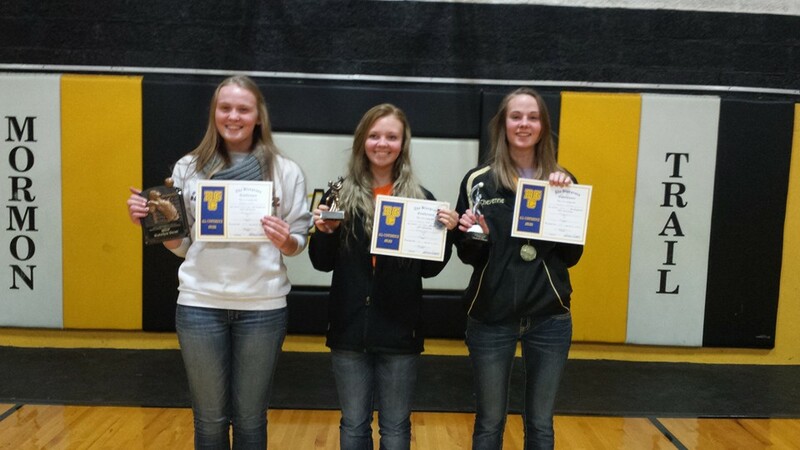 Kaylee Parmer made second team all conference, Katelyn Dent made first team, and Payton Gwinn was honorable mention. 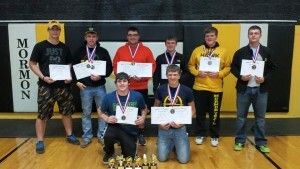 For high school boys, Keaton Gwinn received a hustler award, Cale Hitt was voted Defensive MVP, Andrew Reed was voted offensive MVP and overall MVP. 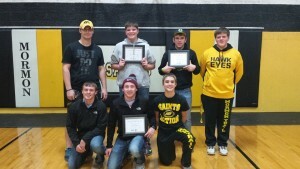 Parker Hitt and Andrew Reed made second team all conference and Kale Horton was honorable mention. On November 12th, many families in the Mormon Trail area gathered for a potluck, and recognized the summer and fall sports players. The coaches for baseball, softball, cross country, football, cheerleading and volleyball gave awards to outstanding players. For baseball, Jakob Horton made first team all conference. Keaton Gwinn, Kale Horton, and Brett Leer made second team, and James Evans was honorable mention. 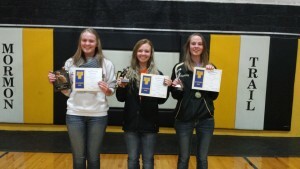 For softball Kailey Stansbery made second team all conference, and Jordan Gehlhaar was honorable mention. 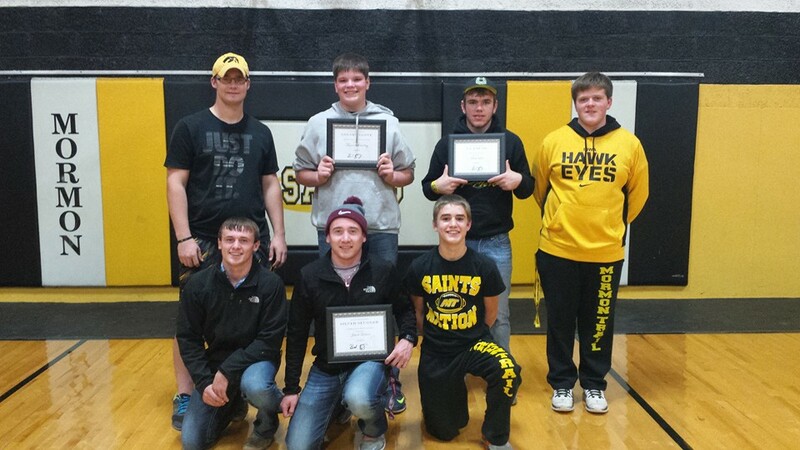 Eight of our twelve football players received a district award. Andrew Reed, Brett Leer and Kale Horton made first team. Jamie Young, Joel Funk, Cale Hitt and Travis Pollock made second team, and James Evans was honorable mention. Brett Leer made first team all district defensive MVP. For volleyball, Katelyn Dent made first team all conference, Gracie Hitt made second team, and Cheyenne Williams was honorable mention. We are all proud of our outstanding athletes, and we hope to see more awards after this basketball season. Go Saints! 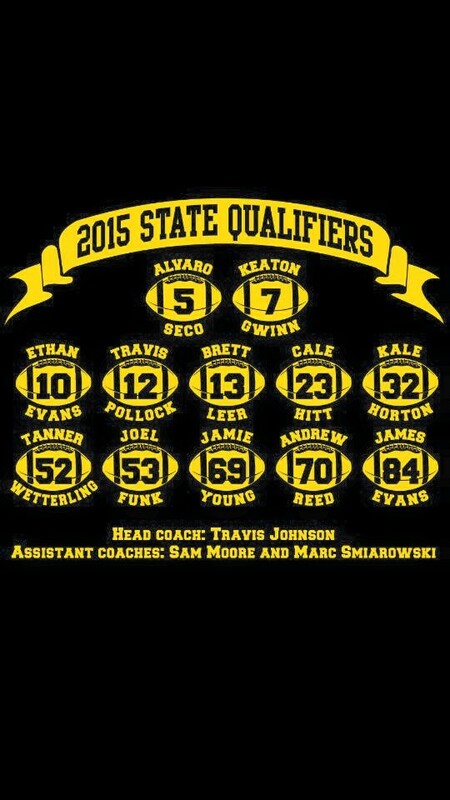 Mormon Trail football team had an historic season. They made it to the playoffs for the first time in Mormon Trail history, and ended with a winning record of 6 & 4. All four teams that they lost to were ranked in the top ten in the state, and had a total of 5 losses between them. The team had a lot of community support throughout the season. Mormon Trail brought a bigger crowd to the playoff game than the home team. Coach Johnson said, “I’d like to say how proud I am of the team for all the hard work they put in and sacrifices they’ve made to make this season the success it was. The seniors had a goal of making the state playoffs from day one of freshman year, and even though they came up short a few times, they never stopped believing that they would reach that goal. It’s a testament to them and their work ethic. What a great group of young men!” Congratulations Saints! 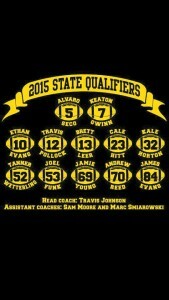 Mormon Trail varsity football team has made it into the 2015 State Playoffs! They are the first team to make it to the playoffs in Mormon Trail’s 55 years of existence. On October 28th they will travel to play their first opponent. We will travel to Victor to play HLV Victor. Kick-off will be at 7:00 pm. 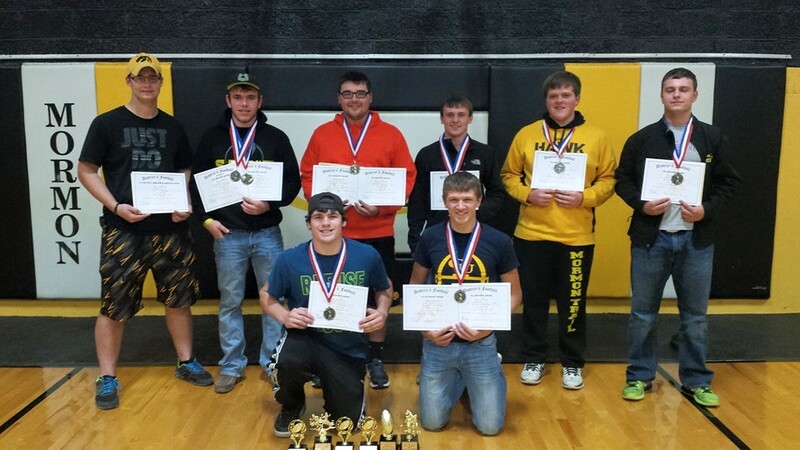 The football team finished 3rd in their district of 8 teams with a record of 6 & 3. Come out and support your Mormon Trail Football Players before their playoff game! We will be lining the streets Wednesday, October 28 to send the boys off in style. There will be a pep bus to take any fans to the game. The cost is $5 per person. Contact a booster club member about riding the pep bus if you would like to go. The Saints would love your support! Hanna May Breuwet is a Junior at Mormon Trail this year. 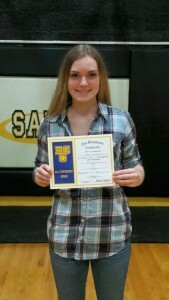 Hanna is involved in volleyball, class office, and yearbook photography. Outside of school Hanna likes to draw, cook, and hang out with her friends. Her best friends are Breanna Glenn and Kaylee Parmer. Hanna thinks she has shown a lot of improvement this volleyball season, and is excited to see how it will continue next year. Her favorite volleyball memory from this year was the very last game she played because it was the most fun and energetic one. Hanna is passionate about art, and plans to get an art degree from Graceland University. “There are many different jobs I would do, as long as I am involved in art,” she says. Hanna is happy that she got to be on the homecoming court this year, and that she’s closer to the end of high school. Her goal is to be on the A honor roll. When asked about her favorite joke she said, “What happens when a frog breaks down? It gets toad away!” Other students may not know that Hanna often takes care of her mother. Hanna prefers white gravy over brown. This is Mormon Trail FFA’s first year having their own, newly charted chapter, which they were recognized for at state convention in Ames. Here, a few members attended and participated in meals for the heartland. Since separating from Central Decatur, Mormon Trail’s sixteen members have been very busy. In May, members hung flags in the Humeston Cemetery for Memorial Day. Officers Brett Leer (president), Baylee Head (VP), Kaylee Parmer (secretary), James Evans (treasurer), Mackinzie Wright (reporter), Brittany Knust (reporter), Reece Myers (sentinel), and Jamie Young (chaplain) attended officer training in June. Kaylee Parmer and Reece Vandell showed at Decatur county fair, and Brett Leer, James Evans, Andrew Reed, and Baylee Head showed at Lucas County fair. At the state fair, Kaylee Parmer, Britany and Courtney Knust, and Reece Vandell participated in Little Hands on the Farm. The state livestock judging team received a silver rating, and the sub-district and district soil judging team received a bronze rating. At Osceola CDE day, the novice team placed first and the greenhand team placed third. Greenhand members (new members), attended a fire up camp at Indianola. The chapter successfully sold mums for a fundraiser, and they are currently selling assorted fruit, cheese, and candy items. One of their biggest accomplishments this year was adopting a section of highway 65, where you can see a sign displayed recognizing them. They are in the process of starting up a middle school FFA for Mormon Trail as well. In the future, members plan to do trash clean up, and host a parent/member banquet.